So which women should and will they sign? Starting with those who were at the first All In, Chelsea Green is the only one we know is not available, unless Madison Rayne is exclusive to ROH: Tessa Blanchard, Jordynne Grace and Britt Baker could all be prospects. And safe to assume Brandi Rhodes is in. Who else could be in the picture? Thoughts? News? Discuss. I think Madison signed a contract with ROH. As has Tenille. 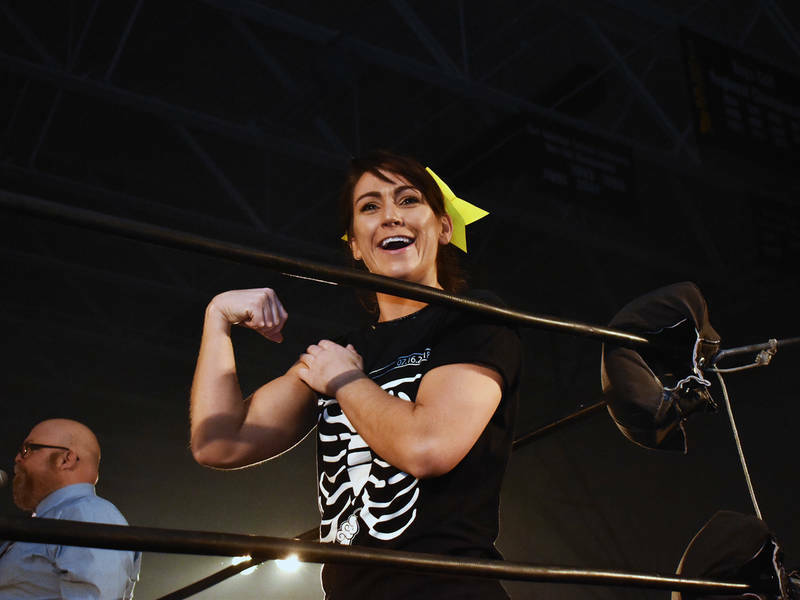 Tessa actually has a signed contract with Impact, but they’re on shaky grounds and I think they’ll try to work with AEW. So that means people like Allie and Rosemary and Su Yung are possibilities too, maybe Taya if her Mexican work is not a priority. Then there’s Penelope Ford and British women that WWE didn’t sign, like Viper and Jinny. Maybe finally Melissa and Mercedes finally get steady work too. Plenty of women out there for a viable division. Kam61 gets the duke for the first correct guess. Britt Baker is the first female to sign. Brandi is in charge of recruiting the women. Someone to keep an eye on in the future is Rob Van Dam’s girlfriend Katie Forbes, who we’ll be seeing soon at WOW under the name of Khloe Hurtz. As that name implies, she’s a charismatic Kardashian look a like. She also has a powerlifter physique and is pretty good in the ring. Speaking of WOW women, there's also current champ Santana Garrett, who's got all it takes to be a major fan favorite. AEW could be a great spot for her. Confirmed today: Penelope Ford is in -- not officially announced as signed, but present at the AEW promotion rally. The big name of the day, though, was Chris Jericho. Also PAC (formerly Neville). Star power building nicely. Update: Contrary to a report I read earlier, Penelope Ford was officially announced as signed. On a related note, Brandi Rhodes' comments (http://www.diva-dirt.com/brandi-rhodes-aew-womens-division/) included a policy that women will be paid equally. "There's no sliding scale," she said. So it's interesting to think about which WWE folk might jump ship when their contracts are up -- and which ones would interest AEW. On the men's side, the biggest name getting kicked around is AJ Styles, since his contract is expiring and he wants a lighter schedule. For that matter, Gallows and Anderson have been wasted, so there's a natural Bullet Club connection there. Besides them, seeing a guy in a "Steen" T-shirt at AEW's rally reminded this week me that Kevin Owens would be a good fit; Vince will never give him a great role because of his physique. Same might be said for Sami Zayn. All these guys have both indy cred and WWE exposure, and all have a lot to contribute to a company. But which women could we see there? When you think about who's getting no air time, Dana Brooke immediately comes to mind, but I don't know that she brings enough to the table to interest AEW. It's hard to think of those who both could have an incentive to leave and would be attractive enough to AEW that they'd match or beat the money. Mostly, they're either where they want to be or, if they move on by choice, would move on to another profession. The major exception: Asuka. Yes, she's a champ at the moment. But even with the belt, she's not the centerpiece of her brand's division: She's #3. She's no longer treated as something special, and her lack of English keeps her from becoming the kind of character the company wants to push. Maybe she'd want to return to Japan, but you could see AEW having an interest in her and her having an interest in them at this stage of her career. She could show a lot more of her stuff than she can now, assuming she has enough others to work with. And here's one other wild card: Paige. Might be that she reaches the point where she thinks she's ready to wrestle again, but WWE won't let her. Once her movie is out, is she getting enough marketing opportunities to stick around? Would leaving mean burning some bridges? Would that stop her? I dunno. There’s a lot of untapped indie women out there that AEW can turn into home grown stars, so I doubt they’ll get into bidding wars for too much WWE talent. Kana would be a major coup, but with Io and Kairi signed I’d think she’d want to work joshi style matches with them first. So maybe in two years or so. Brandi did say that talent is getting paid to the level on their cards. So who is undervalued by WWE right now AEW could elevate? My two choices would be Mickie James, and Bayley. Nick Aldis and that NWA title is going to have some affiliation with this group. Mickie can still work at a co main event level, plus she’s a great teacher. And she’s still very popular. Bayley is being completely wasted at WWE. Cody would definitely know how to use her character correctly and rebuild her to star level quickly. I’d stay clear of Paige for now; she’s just too risky. Her injuries are really serious. It’s not a good look for a new group to be the one she injures herself in again when they know the risk. Looks like Kylie Ray will be signed by AEW. That's noteworthy because a couple weeks ago, reports were coming out that WWE would pick her up along with Viper (AKA Piper Niven), who they did sign. So if she had a choice, score one for the new guys. And maybe a good move for her. WWE is scooping up far more talent than they can (or will) use just to preserve their monopoly. If she wants to work and to stand out, AEW is the better bet right now. There is an American wrestler named Kylie Rae, but that’s not who AEW signed. It’s the Scottish wrestler, Kay Lee Ray. When knows, maybe they’ll eventually sign both and do the gimmick that SHINE did when they had Kimber Lee and Kimberly wrestle each other. Oops: The funny thing is, I actually meant to say Kay Lee Ray, but had a brain fart and put in "Kylie" (even though I kept the "Ray" spelling. then I did the same hunting for a photo. And it was, in fact, Kay Lee Ray who WWE was reportedly going to sign, but didn't. Oops: The funny thing is, I actually meant to say Kay Lee Ray, but had a brain fart and put in "Kylie"
Oy! Turns out it actually is Kylie Rae. On the podcast Dave distinctly said Kay Lee Ray, but he corrected that today. 1. No. Vince has no plans anytime soon to relinquish any creative control. The one factor next year that could change his thinking is the XFL. 2. The women they sign will be pretty good. There’s a lot of talented unsigned performers out there. But that really doesn’t matter much. What matters is how much they can get out of networks and streamers for rights fees. That’s the business right now. Impact’s creative is pretty solid at the moment. But they can’t attract flies on the broadcast market; no one wants their content. So they’re suffering. AEW has the Bucks, Cody, Jericho and Omega. That’s the mix that could get them the right deal.